What will my American Eskimo puppy's size be? 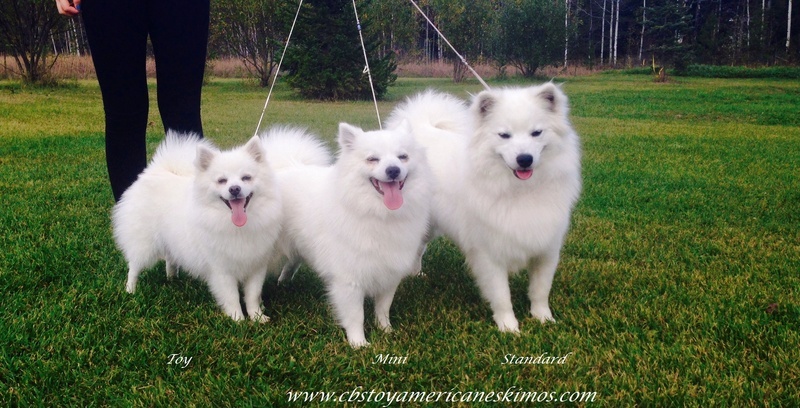 - Toy: CKC CH"CB'S LIL VICTORIA PRIDE"
- Mini: CKC "CB'S GODDESS OF LOVE"
- Standard: CKC "ISLAND'S BABYBLUE AT CB'S"
Because the American Eskimo's were bred down from their standard larger size, there are many genetic factors that play a part in breeding the smaller sizes. Currently, my dogs are producing mixed litters of Toys & Mini's. Unfortunately, there is no guarantee that the puppies will stay at or under the 12" mark. I just cannot guarantee size, but I do believe that with Brooke's Toy breeding, she will throw mainlyToys. Daisy so far has had one litter in 2009, the litter was a mix of Toys & Mini's. IF you are adament about wanting a Toy, the best bet is to ask for the smallest puppy in the litter, this will almost guarantee you a Toy. The biggest puppy in the litter, still should only reach a max size of 13" at the very most. Most of my breeding dogs have a mix of Toys and Mini's in their background. Koda's dam and sire were both Toys as well as Brooke's dam and sire were Toys. Brodie is my newest purchase, he stands only 10.5" and has all toys in his pedigree going back 8 generations. I am trying to keep track of the puppies as they mature, so I am able to get a good idea of what my dogs produce. This 2010 litter is Brooke's first litter, with her Toy background and with Koda's Toy background, they should produce mainly the Toy sizes. As for weight, this will completely depend on the bone structure and stature of your dog. A 12" dog can be 10lbs full grown, or even 20lbs full grown depending on its diet and body type.